[mk_fancy_title tag_name=”h2″ style=”false” color=”#282828″ size=”18″ font_weight=”normal” font_style=”inhert” txt_transform=”none” letter_spacing=”0″ margin_top=”0″ font_family=”Raleway” align=”left” font_type=”google” el_class=”font-medium” margin_bottom=”18″]In 1991 the American Institute of Architects named Frank Lloyd Wright the greatest American architect of all time, and Architectural Record included twelve of Wright’s structures in a list of the one hundred most important buildings of the previous century. Twenty-five Wright projects have been designated National Historic Landmarks, and ten have been named to the tentative World Heritage Site list. [mk_fancy_title tag_name=”h2″ style=”false” color=”#000000″ size=”18″ font_weight=”normal” font_style=”inhert” txt_transform=”none” letter_spacing=”0″ margin_top=”0″ font_family=”Raleway” align=”left” font_type=”google” el_class=”font-medium”]These projects led to the Erdman homes, a series of three prefabricated structures that Wright designed for Marshall Erdman, a builder who had collaborated with Wright. The prefab package Erdman offered included all the major structural components, interior and exterior walls, floors, windows and doors, as well as cabinets and woodwork. In addition to a lot, the buyer had to provide the foundation, the plumbing fixtures, heating units, electric wiring, and drywall, plus the paint. Before the prospective buyer could purchase the house, they needed to submit a topographic map and photos to Wright, who would then determine where the home should sit on the lot. Wright also intended to inspect each home after completion, and to apply his famous glazed red signature brick to the home if it had been completed as planned. During his career, Wright designed over 1000 buildings. 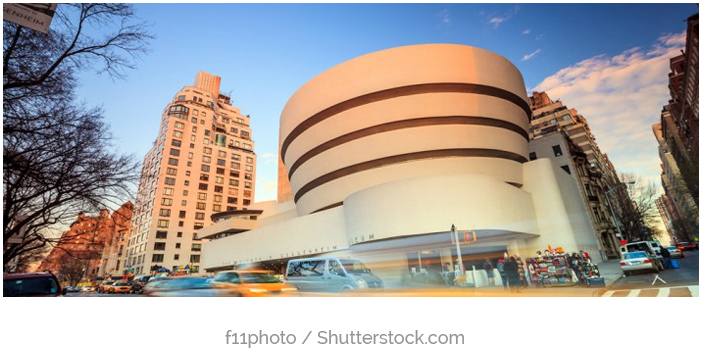 One of Wright’s most iconic designs is the Guggenheim Museum in New York City. It took him 16 years to complete. The building rises as a warm beige spiral from its site on Fifth Avenue; its interior is similar to the inside of a seashell. 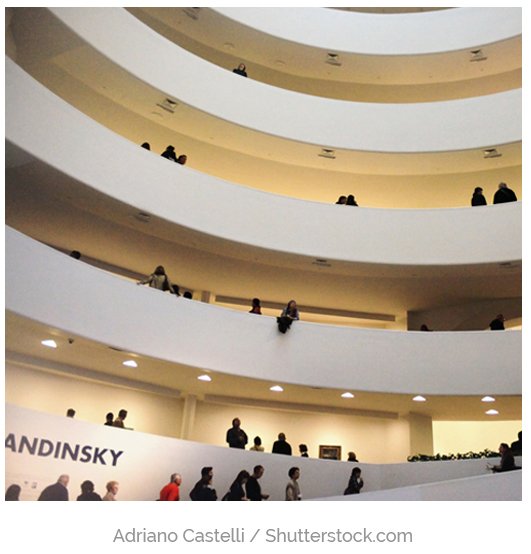 Its unique central geometry was meant to allow visitors to easily experience Guggenheim’s collection of non-objective geometric paintings by taking an elevator to the top level and then viewing artworks by walking down the slowly descending, central spiral ramp, the floor of which is embedded with circular shapes and triangular light fixtures to complement the geometric nature of the structure. 1885 – Wright takes a part-time job as a draftsman. 1889-1892 – Wright works at the architectural firm of Adler and Sullivan. 1890 – Wright is assigned all residential design handled by Adler and Sullivan. 1893 – Wright opens his own practice. 1900 – He writes the lecture “A Philosophy of Fine Art” and “What is Architecture?” as well as articles on Japanese prints and the culture of Japan. 1926 – Wright starts work on his autobiography. 1927 – Wright is made an honorary member of the Academie Royale des Beaux Arts, Belgium. 1938 – Wright designs the January issue of Architectural Forum, which is dedicated to his work. Wright appears on the cover of Time Magazine. 1947 – Wright is awarded an honorary doctorate of fine arts by Princeton University. 1956 – Wright publishes his final book, The Story of the Tower.